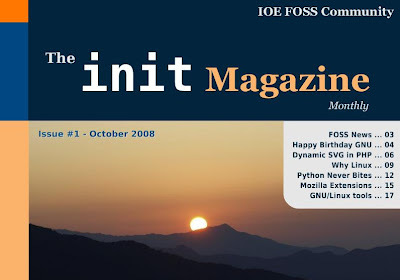 The third issue of The init Magazine is out. Grab your copy now! 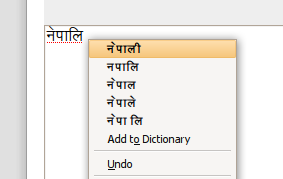 Under Linux, if you have Nepali Spell-check enabled for OpenOffice.org (instructions here), Nepali spell-check works in Firefox as well. But for those who want it just for Firefox (or, Thunderbird), I've created a small extension which does the job. Download the installation package here or from Firefox Addon Page. The extension is currently experimental at Firefox Addon Page. Please drop your valuable review/comments there. Similar kind of message had started to appear my computer since yesterday. I was away from computer n when i came back, there was a libnotification popup message saying 'haha', 'happy birthday.. ' n like that.. i felt like being hacked coz my computer is always connected to internet. More worried than being hacked, i was interested on how it was done.. Read everything from libnotification api to hacking dbus through tcp/ip. I shared this situation to Ankur and Shankar too, and they too were quite puzzled. "The milk is on the table. Go and get it." I was clever this time to take the screenshot. You can see that the internet is disconnected. Surely, it hasn't come through the network. But lets not go into how it was done, lets focus on the message. I took a look at the other table, there was no milk cup too. But still i was confused about the message. Then i got up, turned around, n WTF, THERE WAS A CUP OF MILK ON THE TABLE NEXT TO THE WINDOW!!! Are you kiddin me? I had this run over my spine but still i tried to control myself. Okay, "Go and get it." I was still confused. But i went and drank it (without coffee). Was something to happen to me? Well, nothing happened (but i sure had a terrible headache). Then there were these plethora of questions that ran down my mind. Is 'somebody' 'watching' me? BTW, also look at the fortune cookie quote on the desktop. Does that imply anything? 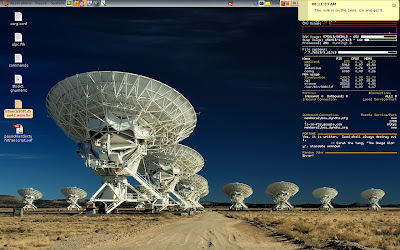 Also note the SETI satellite wallpaper! I was scared to death for a while and shocked till evening. What the hell happened? Also checked if i have dual-personality thingy too ;) Checked all logs, shell history.. nothing! Also wrote a mail to Shankar and Ankur explaining the situation. Ankur was already busy reading books on Conspiracy theory n what not (he always does :)). The whole thing went over-heated among us. And finally during dinner i was asking mom n my sis on who touched my computer during morning. Mom def has nothing to do with my computer. And there was my sis, at first was playin cool but later on was goin like 'haha..' She was the one playing all the pranks with me! Whenever you lock the screen in Linux, there an option to leave a message n i didnt know that.. Seems like she knows more linux functionalities than me.. She was the one behind yesterday's strange messages too.. The whole day i was like, 'OMG, i'm being contacted.. this Matrix thing DOES exist..' haha.. Felt like a total moron later on.. damn! My sis pranked me on my own computer, n i still didnt have a clue about it.. :) But nevertheless, feeling like being a Neo for the whole day was really cool! The day i was supposed to go to Dharan, it was terai bandh and i was at Biratnagar. Really got numb on how to reach Dharan. But fortunately, Prahmod (of PUSET) managed a bike. Dilip (also present at FOSS Orientation Program) dropped me upto Itahari. From there took a bus to Dharan. Coming from a week long stay at Biratnagar, Dharan was a heaven for me. Clean and cool. Abish and Tushar had managed me a room at BP Koirala Institute of Health Science (BPKIHS)'s Boys' hostel. Again impressed by the size of the college. And another impressive thing: no mosquito! I'd already met with Tushar and Abish previously in Biratnagar and had infact known Abish since a long time, so no introduction required. During dinner we talked about the FOSS Training to be conducted the next day. I kept babbling about FOSS and stuffs. Tushar was especially interested on LTSP and Freedom Toaster. These guys were already making up their mind of taking LTSP to schools and cyber cafes.. Especially i found Tushar to be hyper-excited about all these stuffs.. We all stayed late night preparing for the training the next day. BTW, one thing about Abish. He's a medical doctor and a computer geek. Multiple personality disorder, as he admits.. haha. We've been online frens since quite a while and even if there was no FOSS Training program at Dharan, i'd have gone there to meet him. Well, about training, it was supposed to start at 10am, but there was power cut-off. So had to get a generator. And then again a voltage stablizer. The program finally kicked off at 11:30am. 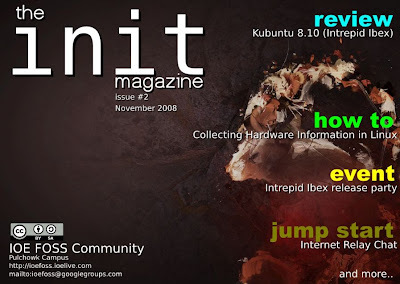 The linux distro for installation was Ubuntu and it was done through Wubi. Previously we also had plans to teach partitioning and other hells but later thought it'd jus scare the newbies. We also demonstrated the whole installation process and it went smooth. Nobody even had a hint of how hard it used to be to install linux couple of years ago..
Linux Desktop Basics basically dealt with general functionality of Linux Desktop (Gnome). It was fairly easy for the trainees to grab the concept. Not much different from Windows when it comes to GUI. Jus point and click. And we should really appreciate the latest distros, who have worked hard to make the shell as obsolete as possible. About FOSS Softwares, almost everybody were familiar with Firefox and VLC. Few of them also had used Openoffice.org before. Lots of them seemed to like Disk Usage Analyzer (baobab). Each topic was followed by a query session. There were questions regarding security of FOSS to how to hide files in Linux ;). Each query session went soo long, we had to cut off the final topics on LTSP and Shell Basics. Everybody were so hyper-excited! There were just one or two guys who knew about FOSS before, but i think they are pretty much ignited now.. I think the training went pretty good. Everybody present there got a copy of Ubuntu Hardy Heron 8.04 -- the CDs we'd burned during Ubuntu release party. 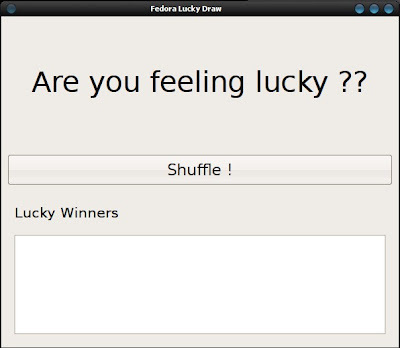 Some of them took Fedora 9 CDs too. And ofcourse, i strongly encouraged them to SHARE the software and the CD. During evening, the organizing team also had a meeting on forming a FOSS Dharan Community and they are going to register it very soon too. We at FOSS Nepal, Kathmandu now need to discuss on how to give affiliation to FOSS Dharan (and others that may form in near future) in a legal way.. 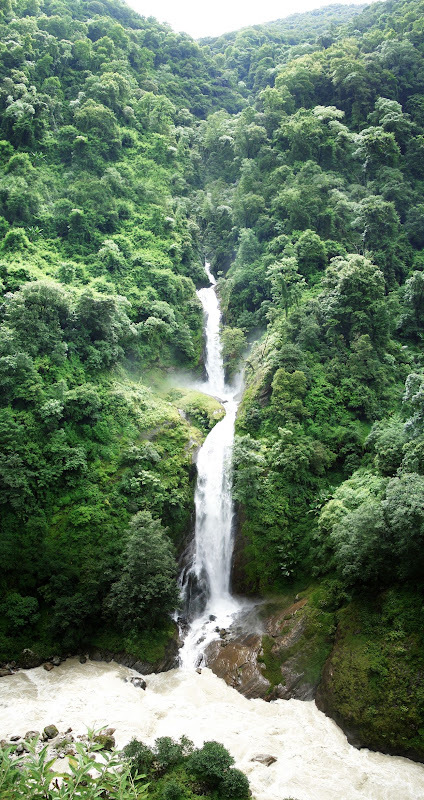 In overall, i should say that FOSS Training at Dharan totally rocked! Finally, thanx to Dharan FOSS Team for the beautiful token of love.. Special thanx to Tushar's mom and sis for the wonderful food! I was at Biratnagar for a workshop/training from my job and for FOSS Training program at nearby Dharan. 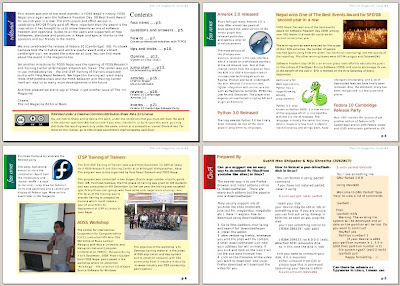 But since guys from Purwanchal University, School of Engineering and Technology (PUSET) were interested, i ended up giving an orientation presentation on FOSS there too. Prahmod from Third year, Computer Engineering took the lead. The date was set for 2nd July, Wednesday. Actually they were having their final exams running and also had an exam on Wednesday. The exam was to be over at 4pm, the program was scheduled for 4:15pm. Despite exam, the turnout was nice i should say. 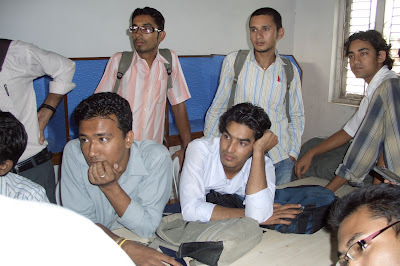 Around 30 students were present in the program and were mostly computer and electronics engineering students. There was no projector so i had to display the slides directly from my laptop. The conference hall was also small for the number of participants present there. Most of them stood the whole time. One funny thing though, some guys already knew me. When i told them my name, some guys were like, aren't you the one from Kantipur FM? 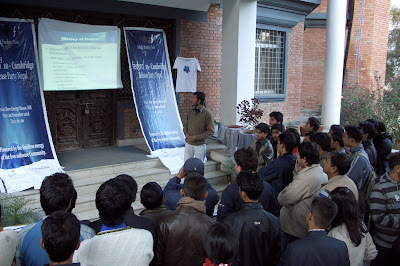 They were refering to the Cybertime program on Kantipur FM where i used to represent FOSS Nepal some time back. Felt like a celebrity ;) Really weird! Didn't like it.. Okay, back to presentation. 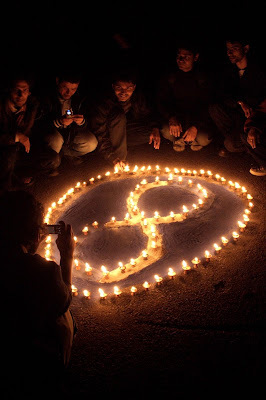 Very few had heard about FOSS before and they were more interested on Linux than FOSS. Maybe the flashy Compiz effects did the trick. But nobody had used linux before. There was a guy named Ranjit (the geek there, as others told me later) who was familiar with Linux theoretically but never had used before. He was skeptic about Linux on being harder to use and softwares being difficult to install. But i showed him the friendliness of Ubuntu and how desktop environments have become simple to use. The presentation went one hour long and despite exam fatigue and the heat, most of them managed to stay and bombard me with questions. Again, more interest was on Linux than FOSS. FOSS - they kinda get it, but they wanna try out Linux ASAP. Gave them few CD/DVDs of Ubuntu, Fedora, OpenCD and Nepalinux. Also encouraged them to SHARE. I think the students are really excited and have shown a strong commitment to form a FOSS Community in the Campus. 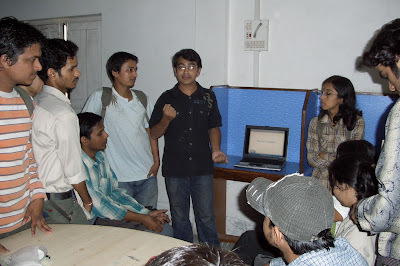 They are also planning to organize a FOSS/Linux training workshop as soon as their exam is over. Some guys really came forward to take the responsibility of forming the community, namely Prahmod, Himalaya, Parbat and Madan. I also talked with other computer professionals and found out that computer literacy is pretty good in Biratnagar (I was amazed with the number of cyber cafes here, they're almost everywhere). But nobody knows about FOSS or Linux. I hope the FOSS Community at PUSET works to change this..
More photos are at here. 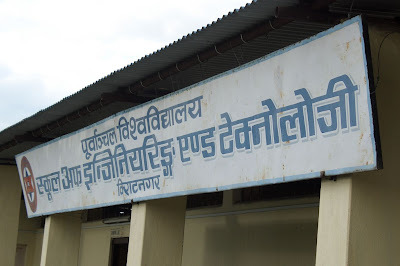 Despite New Nepal promise, Nepal Bandhs (strikes) are here to stay. And the long walks during strikes have become a common devoir. But the walk last thursday is worth remembering and sharing. I was to go to Biratnagar the next day (friday) and i was supposed to take the last flight of the day. But unfortunately due to bandh and some other reasons the ticket was confirmed for the morning. And i had to rush. I had promised the Ubuntu and Fedora CDs to the guys in Biratnagar and Dharan so i had to get them anyhow. Got outta house. Previously arranged gtg with Shankur was cancelled too. I had to collect: Fedora CDs from Prabin, Ubuntu CDs from Suraj, Nepalinux CDs from MPP and Ubuntu Apt-on DVD from Surmandal. Four people to meet and it was already 5 in the evening. I was freakin out already but still started walkin. Met Shankur in Old-baneshowr; we three went to New Baneshowr to meet Prabin. He was with Fedora CDs (from Fedora release party). Prabin gave me a lift upto Shankhamul Bridge on his scooty. Walked from there upto MPP. Met Dayaram dai. Nepalinux CDs were already out of stock so he'd burned me few DVDs. Got that from him and also few Open CDs. Called Suraj and asked him to come to MPP with Ubuntu CDs. APTonDVD remaining. Called Surmandal but the DVD was still not done. Waited for him for a while. Almost dark, we finally met. Still had to burn the DVD. And can you believe? We did it on the footpath of Pulchowk with a super-stinky dog sleeping beside us. Surmandal dropped me upto New Baneshowr on his bike. Walked from there again. And then it rained! It was already 9pm i guess, so no question of stopping. I jus tried to enjoy the rain. Back home totally wet and tired but i had a bag full of CD/DVDs to distribute at Dharan and Biratnagar. It does feel good that to say that everybody in my family uses Firefox. My mom n sis share a laptop which i maintain, so obviously has Firefox. I wonder if my mom even knows whether any other browsers exist! But i had no idea about my dad. But turns out he's also a Firefox user. I'd suggested him Firefox long time ago, but had no idea whether he was using it or not. But last time he downloaded Firefox 3 (thanx to my own blog), it screwed up Flash on his laptop and he was askin me for help. And then he revealed that he uses Firefox all the time. Out of curiosity i asked him why. I've always believed that it's the quality that makes FOSS so ahead of others and now i have a pretty good proof too. I still have a long way to go to convert the OS in my dad n mom's laptop to Linux, but at least Firefox is also a big feat to me. June 17th. Yup, tomorrow! 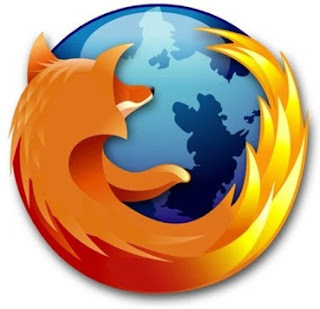 The day Mozilla has set as Firefox 3 Download day to set the record of most downloaded software in 24 hours. And you can be a part of it! Can it be any easier than this? No eating glass or juggling 50 bowling pins. Jus click the link below and download Firefox 3. Besides setting the record, you know what the best part is? 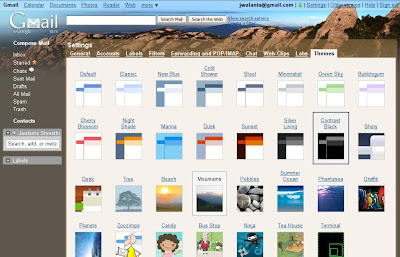 You'll get a brand new Firefox browser - the best internet browser in the world! PS: While you download, i suggest you listen to Coldplay's new album Viva La Vida or, Death and all his friends which has jus been released. My current favorite! The adventure i wanted to do since a long time. 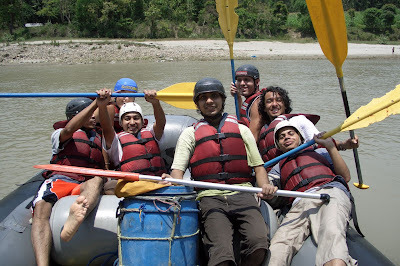 Didn't get chance till 20th Annual Rafting Festival. Trishuli it is.. Everything was in a rush. Got ticket in the last hour. But the point is - we did it. The team members were - Shankar, Ankur, Suvash, Rajiv and me. At the river, a Dutch couple joined us - Jan-Jaap Van Den Hoek & Tamara Jochemsen. Our rafting team. A Dutch couple joined us - Jan-Jaap Van Den Hoek & Tamara Jochemsen. 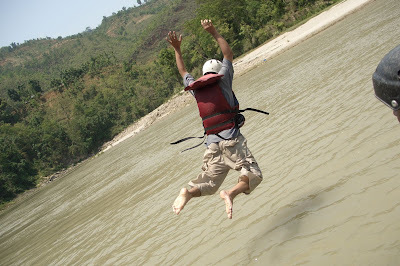 Take me to the river, Dip me in the water..
No doubt, rafting was hell lot of fun. Our captain Katak dai led us to the scariest splashes in the rapids. But at the end, we all felt like we deserve even more rapids. Bhotekoshi or Kali Gandaki next?? Rafting's over. And everybody's exhausted and HUNGRY! Lunch time.. The Dutch couple were really cool. We had a really nice time talkin to them. These guys were on world tour for a year and after rafting they were touring Nepal on motorbike! They taught us some Dutch too. Photos are at my Picasa Album. The party's photo also made to the cover page.. Some off-topic this time. My addiction lately. The latest album of Alanis Morissette -- Flavors of Entanglement. Well, this album is supposed to be released on 2nd June worldwide and on 10th in US. But what can i say, it got leaked over internet! And here i am listening to it on n on. When it's out, i'm sure gonna buy the CD too. I've always liked Alanis Morissette songs, but i believe this is her best album ever. Her previous albums were more focused on lyrics accompanied by usually melancholic piano music. But this is different. Lyrics are strong as always, this time even the music is soo well arranged (Guy Sigsworth ??). Lyrics also have subtle changes. Songs like 'Citizen of the Planet' and 'Underneath' have more global feeling than her signature self-oriented songs. The point is, i'm hooked..
My favorite song in the album: 'In Praise of the Vulnerable Man'. At first i didnt get the lyrics, but later it occurred to me - this song is about her ex! Under similar situation, songs on previous albums would have been more of whine and curse. But this time she seems soo calm. Actually this was originally an e-mail but since a lot of my frens have been asking me about the procedure, i thought it would be helpful to others too to put it here.. The following steps apply to personal webpages, but can be followed to obtain a .com.np for other purpose too..
First of all, some background. The official registrar for .np ccTLD (country code top level domain) is Mercantile Communications and it provides it for FREE! The official website for the registration is Register.com.np. However there are some paperworks involved too. Most importantly, you need to be a Nepali citizen and you need to submit the photocopy of your (Nepali) citizenship ID to get the domain. First of all you need a webspace ready. It's good if u have a webspace already, but since here we're talkin about getting a .com.np for free, lets opt in for some free ones. You can choose any but make sure it supports domain parking facility. Awardspace and 110MB are some good ones that i know. (But as you know free are free. If you want a solid and reliable hosting, i recommend paid ones). Register for the webspace and get the DNS addresses. Look somewhere in the settings of the hosting site. It usually has ns1, ns2, etc as prefix. For example, for awardspace.com, the DNS addresses are ns1.awardspace.com and ns2.awardspace.com. Now you also need to get the IP addresses of the DNS server. To get that, go to shell (command line) and enter something like 'ping <address>'. It'll give you the IP address..
Get IP addresses for all the DNS servers of your host. 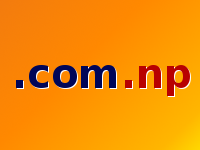 Now the registration part, go to www.register.com.np and check the availability of domain. Remember, you can register only the name that corresponds to your actual name. For example, i can get www.jwalanta.com.np or www.jwalantashrestha.com.np but not anything else. So be careful while choosing name. Put it exactly what your citizenship says. Anything different and chances are your application is gonna be rejected. Ok back to registration form (http://www.register.com.np/form.asp). Enter all the details. In the primary and secondary name server, put the DNS addresses that we got from step . No need to fill up ternary name server. Or if you want, just copy secondary name server. Submit it and the name will be reserved. (It's only reserved, not registered). Now put the domain name you just reserved in the domain parking option of your webhost. [important!]. For example, if i reserved the domain name jwalanta.com.np, i'd put that in the domain parking option. Write an application, get your citizenship photocopied and take it to Mercantile Communication's office at Durbarmarg, Kathmandu. It'll take around 2 days to process the application and perhaps 1 more day for the DNS servers worldwide to be updated about your domain. Congratulations, you've got your personal .com.np! ZeroEnergy House at IOE was chosen because the building is self sustained, i.e. it takes no energy from outside sources. Perfect for us in this loadshedding laden country! Go to Synaptic, set the source to Ubuntu DVD, select all the packages and download them to local repository. This would download all the packages in the DVD minus packages in Ubuntu CD to the harddisk. But we seriously needed money for replicating the CDs. Thankfully, Young Innovations Pvt. Ltd. agreed to sponsor NRs. 4000 (thanx Bibek). We called up the CD Replicating guys, the rate was Rs 15 for CD and 25 for DVD. So the plan was to replicate 100 CDs and 100 DVDs (100x(15+25)=4000). So far so good. But things didn't go as we'd planned. Saroj got the Extra Packages DVD ready, but due to some misunderstandings, the CD Replicator ppl replicated something else. APTonCD became JPTonCD :D. CDs were good however. After the program, we had a brief CD sales session. The CD was tagged Rs. 15 to recover the cost. Most of the participants bought the CD too. Lets hope they'll follow the spirit of Ubuntu - 'Pass it on'. Light refreshment followed. Tea and Cookies. This also gave us time to mingle up with each other and finding out the real person behind the IRC alias. Everyone was like, "OMG that's you?" It was fun..
Now we've still got some money left previously allocated to burn DVDs. We've decided to use it to burn some more CDs and distribute them at FOSS Stall in Locus Tech Fest. It's a huge event and i hope we'll reach more people there..
Thanx to Surmandal and Shankar for the photos.